Established in 1973, Chitwan National Park is extended over an area of 935 sq. kms and is Nepalâ��s first ever national park. 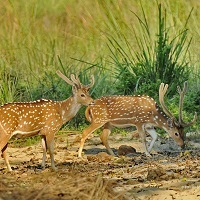 The remnants of the jungles, the last populace of the one-horned rhinoceros and the last of the refuges of Bengal Tiger are found in this wildlife national park. Other such species are: Gharial(crocodile), gaur, Striped hyena, monitor lizard, Gangetic dolphin, python, four horned antelope, wild elephant, pangolin, etc. Jeep safari and elephant safari are the best means to have a close encounter with the natural beauty and the rarefied species of this region. Canoe ride gives you an insight into the water inhabitants. Binoculars and cameras are to be brought by the tourists on their own to capture their enthralling experiences. Chitwan Jungle Lodge, Green Mansions Jungle, Machan Wildlife Resort, Safari Adventure Lodge, Tiger Tops Jungle Lodge, Rhino Residency Resort, Temple Tiger Jungle Lodge, Gaida Wildlife Camp, Island Jungle Resort etc.